Phil asks for Julie's help now that Loretta has died. JULIE: Alright, I'll help you. Phil starts to say how sorry he is and what a mess of things he's made, but she says he has to think of his future with the children now. Someone will have to tell them about the death of their mother and Julie offers to do it. PHIL: They're going to need someone...they need you, Julie. Julie says she'll go and pick them up in the morning, it doesn't matter about the long distance. She tells Phil tearfully to get some sleep then squeezes his hand. Terry has popped round to visit Daphne. She's worried about what Charles will do next. Daphne advises Terry to just give Charles the tape, but Terry reckons it's her only insurance. Julie hasn't slept and is having a quick coffee before going up to pick up Phil's children. JULIE: Dad...you wouldn't mind if Debbie and Michael came back here, would you? JULIE: Well...because last night...Philip's wife died. HELEN:(coming over) Oh, how sad. Of course, bring them here if that's what you want. Julie leaves to go and pick up the children. Julie has arrived at Phil's neighbour's house. The neighbour, Mrs Finn, isn't in a very good mood at being left with the children all night. Julie explains that she's come to collect the children and quietly explains that Loretta has passed away. The neighbour is very shocked and looks over at Debbie and Michael who are playing happily in some hay. Julie asks the neighbour to collect the children's clothing while she goes to talk to them. JULIE:(to Debbie and Michael) Hello. My name's Julie, I'm a friend of your father's. George is suggesting to Eileen that she leaves her job with Max, but Eileen says that she has to see out her month's trial period. Eileen catches sight of Sarah and isn't pleased to be referred to as "Aunty Eileen". Helen and Terry are discussing Phil's children and in the middle of it, Julie arrives. Debbie and Michael are very subdued so Terry takes them off for a drink in the kitchen. JULIE: Gran, you should have seen their little faces. 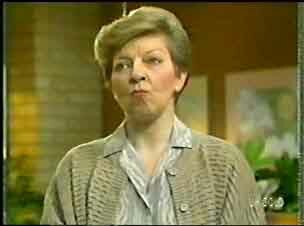 Terry comes back and suggests the children stay with her - there isn't much room at the Robinsons. Julie isn't sure but finally agrees. Sarah mentions her row with Daphne to Des. Des immediately takes Daphne's side and says that Sarah must have misunderstood. SARAH: You men really don't know when women are being bitchy to one another, do you! DES: Maybe, but that's not the Daphne I know. Julie, Debbie and Michael are playing in the garden. Helen calls Julie into the house - she's had a call from the hospital and Phil has had a bit of a set-back. They didn't say what it was. Julie rushes off to the hospital. Terry is reading Michael and Debbie a story when Paul comes home. He's not really pleased to see them (not knowing what's happened). PAUL: Terry, it's not very often we get some time alone together and I thought we could go somewhere...just the two of us. PAUL: What did Julie dump them here for? Where's their mother? George comes round to see Max. He's still in a temper about the previous evening and tells Max that he's a "coarse and unpleasant" man(!) Max tries not to laugh. 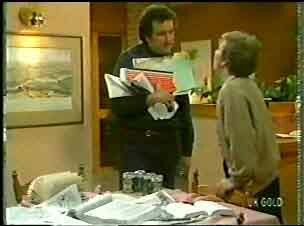 George goes on to say that Eileen is a fine woman and Max had better start respecting her! The nurse tells Julie that Phil is still with the doctor. She refuses to leave until she's seen Phil. Paul comes in through the back door. He feels bad about putting his foot in it with the children. Paul thinks Terry is getting clucky and it's surprised him a bit. Des admits that he really misses Joan and the kids and thinks about them every day. 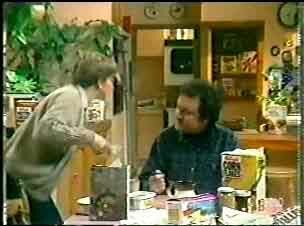 Sarah comes in and Des introduces her to Paul. Eileen stalks in. Max tells her about George's visit. Eileen gets even more angry and stalks out. Des, Daphne and Sarah are watching a rather boring documentary about diamonds. Daphne seems quite interested in it though! Des suggests putting on a record and then Eileen comes in. The atmosphere is a bit charged between her and Sarah, so Sarah decides to flounce off to bed. DES: You are judging her completely on your dislike of her mother. I mean, thank God no-one uses the same yardstick on me! Des tells Eileen that he's going to ask Sarah to stay on and Eileen is not pleased. She storms out. DES: Well, that's one way to clear a place! Daphne is a bit alarmed that Des is thinking of asking Sarah to stay on. DAPHNE: No way! It's her or me!